Diet soda has always branded itself as a healthier alternative to the regular stuff. It usually contains less sugar and makes you feel guilt-free for consuming. Pretty soon, you find yourself drinking it every day, typically with your lunch. You’ve become so comfortable with it that you can’t see why you’d ever need to change. That is, until you visit your dentist for your regular checkup. After a few minutes into your examination, your dentist asks you “Have you been eating more sugar lately?” At this point you’re confused. By drinking diet soda, you’re drinking less sugar by definition. How could you still have cavities? If it wasn’t for sweeteners and acids to make the drink taste good, diet sodas would have never become popular. Two of the most popular artificial sweeteners cola companies use to entice consumers includes phosphoric acid and citric acid. While neither of these cause oral bacteria to produce acid in the same way that sugar does, it doesn’t mean they aren’t still eroding your tooth enamel. In fact, after scientists at the University of Melbourne in Australia tested 23 different types of sports drinks and sodas, they found that drinks containing the acidic additives still caused significant damage to tooth enamel, even though they didn’t contain sugar. You might think that because diet soda has zero sugar in it that it will be a safe alternative to drink every day. However, just because the word “diet” is in the name doesn’t mean it’s safe to consume on a regular basis. By using that word on the label, cola companies are convincing Americans that they can consume soda more often, when it simply isn’t the case. Regardless, by putting this concept of “sugar-free” in the patient’s mind, there’s nothing stopping them from having it with multiple meals a day, guilt-free. Even though there are multiple ingredients that cause dental erosion, people have convinced themselves that it’s safer to drink. One of the biggest problems of drinking soda regularly is that you won’t be getting enough water in your diet as a result. 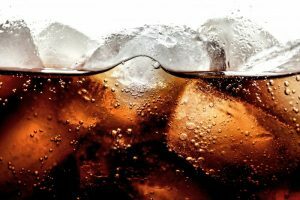 Even diet soda contains harmful ingredients that can lead to dental decay over extended consumption. Water always works better at removing food debris from your mouth without eroding your tooth enamel in the process. However, your dentist understands that you may have difficulty quitting your diet soda habit at first. That’s why it’s better to drink plain sparkling water with your meals instead. It contains no added ingredients and provides the carbonated essence that you’re likely craving. However, don’t let it replace water entirely. Since carbonated water is simply water that’s been treated with carbon dioxide, it contains carbonic acid, making it more acidic than plain water. The key is to maintain a balance: drink plain water regularly throughout the day but replace your diet soda with sparkling water to make the transition easier. Have more questions on improving your oral health via your diet? Schedule an appointment with your dentist to learn about foods that promote oral health! Dr. Benjamin Hornstein has experience in all areas of dentistry, including pediatric, cosmetic, preventive, and periodontal, so you can expect the highest level of care regardless of the treatment you’re seeking. To help others expand their skills, he regularly shares his techniques with other dentists around the world, through dental courses. To learn more about his preventive techniques and practice, contact him at (216) 595-1710 or visit his website.